Our hotel is located in the heart of the Salzburgerland, Saalachtal. Hotel Dax is surrounded by a beautiful natural landscape, which is appreciated by visitors. The area is for families and active visitors who would like to experience a land like this. The view of the imposing Lofer Steinberge mountains and the short walk to the lift as well as our cosy rooms and suites, will make the best ideal holiday destination. Hotel Dax in Lofer will make you a pleasant and memorable stay in the province of Salzburg. Experience not only Salzburg hospitality with us, but also the stylish ambience of our rooms and suites in Lofer, which of course are bookable with half board in different categories. For the best days of the year, we also offer family packages with interesting inclusive services from the Beauty and Wellness area. A wonderful holiday in Lofer awaits you! 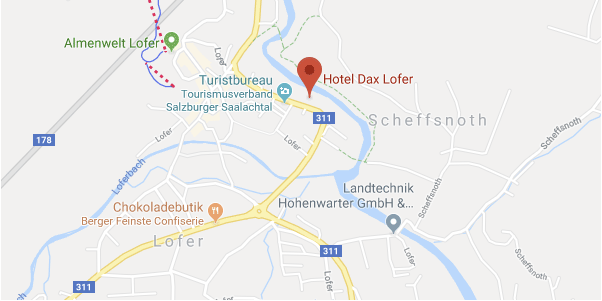 A rich breakfast buffet, cake in the afternoon and in the evening a 4-course menu or changing buffets, each with a large selection of salads and desserts - to your heart's content feasting, that is part of a holiday at Hotel Dax in Lofer! Directly in front of the hotel our parking facilities are of course free of charge. The parking is only for our hotel guests. Ski Group is one of the leading ski tour operators in Scandinavia and since 2015 our sales team Lion Alpin has been located in Switzerland and now belongs to one of the successful brands under Ski Group. Our hotel chain, SG Hotels, consists of 10 hotels, all of which are close to the areas attractions and activities. Our hotels are within walking distance to the ski lifts, close to the village centers and are easily accessible by public transportation. Each of our hotels has its own flair – from traditional to modern, there is something for everyone. We house vacationers from all over the world, especially Scandinavian and Dutch guests. The compilation of the many guest nationalities presents us with a special challenge, which is why we carefully select our employees and thus lead very international teams.